Increased cyclist and pedestrian deaths in Scotland show that improving vulnerable road-user safety should be a priority, the Royal Society for the Prevention of Accidents (RoSPA) have insisted. Provisional road casualty figures show that 898 cyclists were injured on Scottish roads in 2012, with 167 seriously injured and nine killed. 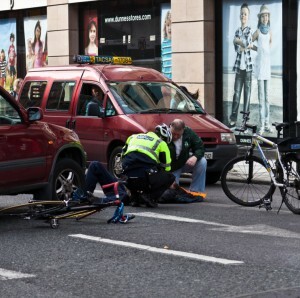 Cyclist injuries increased by 9% compared to 2011, with serious injuries up by 11 and deaths up by two. Similarly, while 1,950 pedestrian casualties in 2012 meant a 5% year-on-year drop, 54 pedestrians were killed – 11 more than in 2011. Overall, there were 170 road deaths in Scotland in 2012 – 8% fewer than in 2011 and the lowest number since records began more than 60 years ago. A total of 1,959 people were seriously injured – 4% more than in 2011 – and 10,446 were slightly injured, 3% fewer than in 2011. Karen McDonnell, Head of RoSPA Scotland, said: “As in previous years, the publication of road casualty figures for Scotland has shown that we cannot lose sight of the work that still needs to be done on making our roads safer, particularly where vulnerable road users like cyclists and pedestrians are concerned. “RoSPA encourages people to walk and cycle and we know that concerns about safety are often cited as barriers to these modes of transport. Among motorcyclists, there were 864 casualties (+7%), 342 serious injuries – up by 49 – and 21 deaths, 12 fewer than in 2011. There were 7,577 car user casualties, of whom 72 were killed – a decrease of 17 – and 836 seriously injuries, an increase of 80. Child casualties decreased, with two deaths compared with seven in 2011; one victim was a cyclist with the other a pedestrian. Ms McDonnell added: “Scotland’s Road Safety Framework to 2020 includes commitments on cyclist and pedestrian safety and some good work is ongoing. “However, we urge all those involved in road safety across Scotland to redouble their efforts in these areas. Scotland’s target is to reduce the number of people killed in road accidents by 2020, based on a 2004-08 baseline average.